After more than a half-century defined by mistrust and rancor, the United States officially reopened its six-story embassy in the Cuban capital on Monday, the culmination of many months of negotiations to overcome decades of historical enmity and to restore diplomatic relations between the two nations. More than two years of effort went into restoring relations between Cuba and the United States, both public and private, yet most observers say they believe it will be many more years before mutual wariness fades. 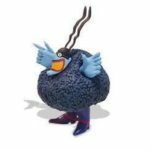 Re-establishing diplomatic relations does not resolve a host of issues for further negotiations. A litany of questions have yet to be answered, including: Will the American trade embargo that has crippled Cuba’s economy be lifted, and if so, when? Will the Cuban government improve its human rights record and incorporate outsiders into the political spectrum? How much, and how fast, will the lives of ordinary Cubans, who earn $20 a month on average, improve? But for now, the reopening of the embassy on the Malecón waterfront in Havana, previously used as an interests section, a limited diplomatic outpost, stands as the most concrete symbol yet of the thaw set in motion last year when President Obama ordered the full restoration of diplomatic ties between the countries. In Washington shouts of “Viva Cuba” rang out on Monday as Cuba’s foreign minister, Bruno Rodríguez, raised his country’s flag outside the newly reopened Cuban embassy. For now, though, the change, was barely perceptible from the outside, arguably a metaphor for the state of Cuba itself. Technically, there will be differences. Diplomats will be formally registered, and, for the first time since the embassy was closed, they will be allowed to travel freely in Cuba. They will be invited to functions, too, like members of other diplomatic corps. The American government is supposed to ease access for Cubans entering the embassy and for the American Foreign Service officers inside, a State Department official said. Mr. Obama, when announcing an end to the diplomatic freeze, eased travel restrictions, opened the door for more remittances to Cuba, and expanded the amount of goods that visiting Americans could take home, like Cuban cigars and rum. In May, he removed the country from the list of nations that sponsor terrorism. Secretary of State John Kerry will travel to Cuba on Aug. 14 to raise the flag over the newly opened U.S. Embassy, according to CNN. 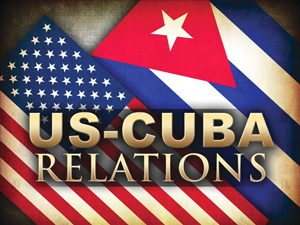 The U.S. and Cuba restored full diplomatic relations on Monday, opening embassies that have been shuttered since 1961. Kerry’s trip to Havana will be the first for a U.S. secretary of State since 1945, CNN reported. The Cuban flag was raised over the country’s embassy in Washington on Monday, but the U.S. is waiting for Kerry to visit Cuba to put up the flag there. Cuban Foreign Minister Bruno Rodriguez attended the flag-raising ceremony in Washington on Monday. He was also to scheduled to meet with Kerry, in the first meeting between the countries’ top two diplomats on U.S.soil since the 1959 Cuban revolution. This is one “fugly” Embassy building. According to Wikipedia, “The embassy was designed in the Modernist—Brutalist style by the architectural firm Harrison & Abramovitz. 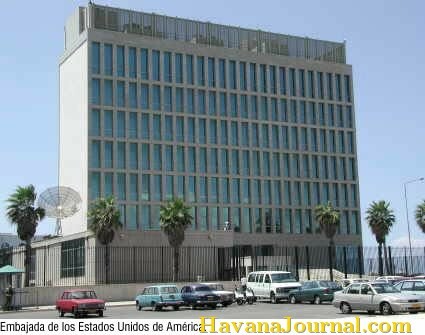 It is a long and six-story concrete and glass building, completed in 1953.” Maybe we should look into building a new Embassy building in a Spanish Colonial design that blends in with the historical architecture of Havana. Consider it an act of good will — and good taste. The building housed the United States Interests Section in Havana between 1977 and 2015, which operated under the auspices of the Swiss Embassy (acting as protecting power). On July 1, 2015 it was announced that with the resumption of diplomatic ties, the building would resume its role as the U.S. Embassy in Cuba on July 20, 2015. Previous article#BlackLivesMatter Protest: Watch the Videos!